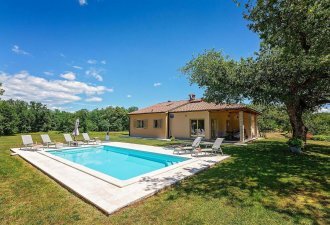 Casa Ripenda is a nice holiday home in the suburb Ripenda Verbanci, 2,5 km from the town Labin and 8 km from the well-known tourist town Rabac. On a completely enclosed property of 600 sqm, Casa Ripenda offers to the guests a swimming pool of 32 sqm, 8 sun chairs, a covered terrace with table, chairs and barbecue, children's playground and three parking spaces. The discreet homeowner lives in the back of the property, separate from the holiday home and its property. Casa Ripenda of 135 sqm consists of two separate apartments. The larger apartment has a fully equipped kitchen, dining room and living room with exit to the covered terrace and swimming pool, two double bedrooms, a bedroom with two single beds, a spacious bathroom/toilet and a shower/toilet. The smaller apartment has a separate entrance and a smaller terrace with table and chairs for four people, equipped kitchen and living room with dining table, a bedroom with double bed and a shower/toilet.